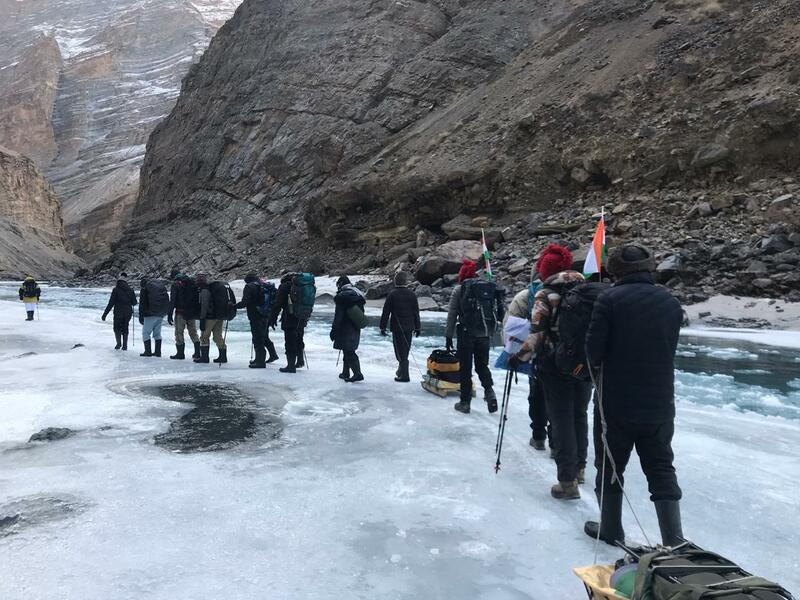 To commemorate the momentous occasion of 70th Republic Day, AF Station Thoise conducted a trekking expedition in the daunting terrain of Ladakh region. This arduous expedition on the frozen Zanskar river was undertaken by the air warriors of Air Force Station, Thoise. The team leader and overall coordinator of this adventurous expedition was Wg Cdr Vikrant Uniyal, a qualified mountaineer from Army Mountaineering Institute, Siachen. The expedition team comprising seven air warriors covered a total distance of 65 kms in five days through a treacherous route on the frozen Zanskarriver. The Chadar Trek is one of the toughest and most challenging trails in the country. The trek began from “Chilling” and continued on Chadar (frozen Zanskarriver) via “Tibb” cave till “Naerak” village. The nights were spent in tents near caves near the frozen river at an altitude of 13000 ft.
During the course of the trek the team saved the life of another trekker who had fallen in the water when the ice crust under him broke. The IAF team was nearby and responded to the cries of the individual who was pulled out of the icy water using the equipment available with the team. Despite the harsh environmental conditions unique to this terrain, the air warriors completed this challenging and arduous expedition in the most professional manner. The mercury count was between -15 and -20 degrees during daytime while it dropped to -25 degrees at night.